In the spirit of the listen. imagine. do model, the Hub has begun facilitating executive-led projects, where the Hub acts in a supporting role to the leader and team members involved. The first project in this series was the Breast Cancer Journey Project, which is detailed here. We say that these projects are in a "Design Race" format, in that they are fast paced, and increasingly exciting because of it. They are generally 7 week projects, with each week containing a specific theme: kickoff, research, empathy, synthesis, brainstorm, prototype, and storytelling. There are many more Design Races on the frontier, and we are very excited to continue learning how to best facilitate and support these projects. Enjoy this video, summarizing the project! This project began with a team looking to improve a patient's experience as they navigate the diagnosis and treatment of breast cancer. From the get-go we were surrounded by impactful stories and information. In our first meeting, we did an in-person interview with a Sibley patient who had gone through this experience many years ago, and we immediately realized that we were just seeing the tip of the iceberg. From that point forward, we were learning at every step of the way, whether through our research or interviews. Here are some short snippets from each of our weeks, read more by going to the Blog! Team members shared reasearch about demographics and statistics such as the rates of occurrence in DC versus surrounding areas and range of ages most commonly affected. We did a literature review to see what current studies have said about psychological tendencies, about current interventions that are being used, about “personhood”, and about dignity throughout the process. We read blogs both in the support and derision of “pinktober”, about “scanxiety”, and about individual experience. We even listened to the work of standup comedian Tig Notaro who was diagnosed with cancer in both breasts and opted to have a double mastectomy. Our interviews ranged from interviews of family and friends, to interviews of current patients that were at various points throughout their treatment. We heard stories about individuals’ relationship with “normal”. We learned about the many ways that one could try to find comfort—for some, something as simple as starting blog, and for others cosmetic surgeries or entirely changing their outlook on life. People expressed discomfort around certain visual and auditory triggers, like the music that gets played during treatments. People shared both the benefits and stress related to their support groups, the treatment journey, the people they met along the way—it was endlessly valuable and impactful. Using this, we synthesized our findings by creating a journey map. 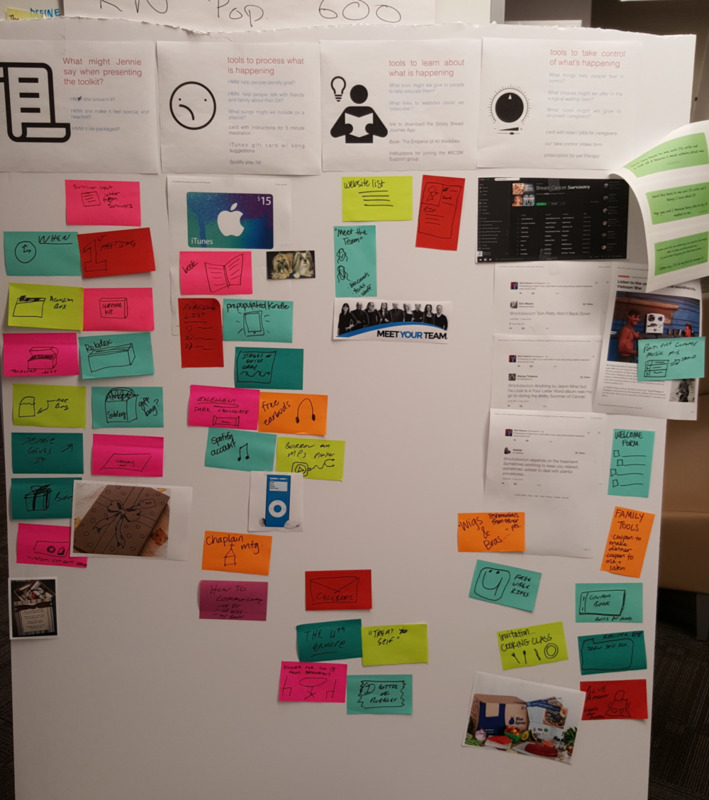 The map had spaces to put post-its with emotional states, triggers, goals, and opportunities that might exist with each point in the process. How might we mark the firsts that occur throughout the process? How might we reduce the feeling of being out of control/being overwhelmed? How might we enhance the feeling of being in good hands? How might we encourage family members to take part of the patient’s care to decrease everyone’s feeling of isolation? How might we provide choices that reinforce a patient’s sense of control? Based on our brainstorming and our research, we came together and built a prototype that tried to address what we heard. We created a toolkit to give to patients—a toolkit with options, with opportunities, and with education, something that patients could use at their own leisure and own pace. To convey these messages, we put in the kit three sealed envelopes labeled learn, control, and process. Each to be opened when and if needed, at the patient’s discretion. Each to begin with a personal letter of support from someone at Sibley or a survivor. With storytelling, we hope to share our journey through the process. Whether this is through a video, presentation, paper, etc. storytelling is a vital piece to the design process because it is how we display our findings to others. Much like this page, we hope to show the steps that we took to along the way in developing our ideas and to explain how we arrived at the prototype that we have currently designed. There are a lot of ways to share the story, it is just important to display your journey and findings.